I’ve written about EO before and I really like this family owned and operated brand that uses only natural and certified organic ingredients. It’s a Californian company, but is available here through EO Ireland, which was launched by Catherine Murphy in June 2010. Catherine has always been interested in natural, cruelty free products and redundancy gave her the push to turn this into a business. She came across EO while living in New York and fell for their natural scents and quality ingredients, not to mention their ethical and environmental standards. A test run at an Irish Christmas market told her she was onto a winner: she sold her entire stock within 3 hours, with people coming back for more. EO is also a favourite of Bobbi Brown, who recently named their Peppermint Hand Sanitiser as the one product she can’t live without. It’s so pure that she even uses it as a breath spray! I was given the spray to try out for myself, along with the Rosemary and Peppermint Shampoo and Conditioner. The shampoo is a clear gel that foams up nicely, while the conditioner is a thick, creamy off-white colour. Both smell wonderful: fresh, uplifting and the perfect morning pick me-up, although the scent doesn’t linger in the hair. The Rosemary and Peppermint range is marketed at normal to fine hair but works wonderfully on my thick, coarse, frizz-prone locks. Interestingly, I get similar results with these as I do with products that contain silicone. My hair likes silicone for its detangling and smoothing ways, but it also makes it oilier, faster. This isn’t the case with these products, and I can see them appealing to those who don't like synthetic ingredients or are afraid of product build-up. The shampoo and conditioner are both €12.99. The hand sanitiser, €4.99, is just lovely, too. The organic peppermint oil means this smells absolutely divine and is a real pleasure to use. It feels fresh and soothing, and contains vegetable glycerine for natural hydration. But here, you don’t have to take my word for it. 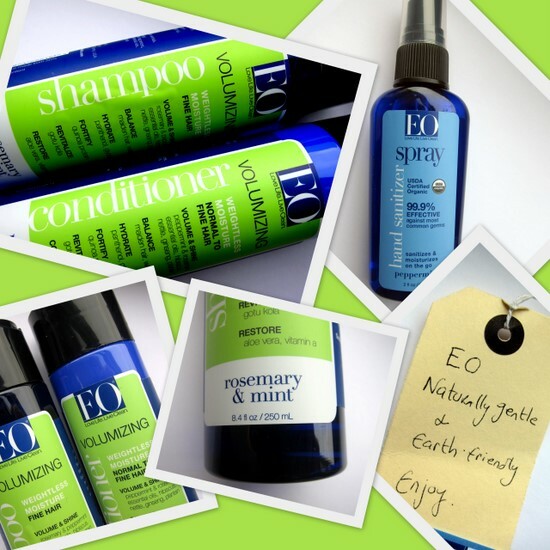 You can try them out for yourself, as the lovely people at EO have promised a shampoo and conditioner of your choice, along with a hand sanitiser spray, for one lucky reader of Fluff and Fripperies. 1. To enter you must be following Fluff and Fripperies through Google Friend Connect (you can do this through a google, twitter or yahoo account – hit the Join this Site button under the Facebook gadget, in the sidebar to the right there). I’ll be checking! 2. Leave a comment with the name you are following under through GFC, plus an email address or twitter name where you can be reached if you win (if you don’t want to leave your email, just leave a comment and mail me on emma at fluffandfripperies dot com). If you’re on Twitter it would be great if you could also tweet about this giveaway with the hashtag #eoireland (and why not give them a follow while you're at it! ), but it’s not a condition of entry. This giveaway is only open in the UK and Republic of Ireland. A winner will be selected at random and informed one week from today. An international giveaway is currently open on the Fluff and Fripperies Facebook page and one will be coming up on the site soon! The hand sanitiser sounds great! great! hope i could win something! These look really lovely, great giveaway =] I recently started following your blog and have really enjoyed reading your posts. Thumbs up to the cruelty freeness and the peppermintyness is a major plus:) They sound delicious! I've nominated you for the Kreativ blog award - check yourself out on Ballet Pumps And Roses. I'm in to win! The hand sanitiser works just as well as a quick-zap air freshener. It looks fabulous! If out of the country people can enter, please count me in! Love the sound of the hand sanitizer! but is this open internationally? I've tried this line and it's wonderful. The hand sanitizer is great! Sounds like a great product, thanks for doing a review on it! Nice prize! Good luck to everyone! Following by email at inner_happiness_76@yahoo.ie. I'm sold on this- love rosemary/ mint combinations. Think Aveda do a shampoo with this scent and I fell in love!